Towels are one of those things I always forget about when I travel. I only remember them when I am confronted with a scratchy and mysteriously stained hotel towel, asked to pay a service fee for towel use in a hostel, or forced to use a dirty t-shirt to dry off when I’m camping. When I am home, I totally take my towels for granted, and when I travel they tend to be left off of my pack list. Fortunately, there are some fantastic travel towel options on the market now. Towels that are so small, portable, and stylish that I will be happy to pack them. Below is a list of travel-friendly options. Make the purchase, leave the towel in your suitcase, and never dry off with yesterday’s t-shirt again! Microfiber may be one of my favorite recent inventions. Lightweight and super absorbent, it is small to pack and practical to use. For years, microfibers were reserved for car detailing and screen cleaning, but now you can find full body versions for all of your personal drying needs! This RainLeaf towel is a traveler’s dream. It is brightly colored and comes with a compact, waterproof sleeve. It features a snap loop at one corner, which makes it easy to hang up to dry, and even has a corner zip pocket which can securely hold your keys and phone when you’re at the pool or the beach. 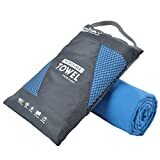 Whether you are backpacking, hostel living, or just wanting to avoid hotel towels, this microfiber is small enough to stow anywhere, and a fantastic product to use. This is another microfiber towel, which means it comes with all of the super-absorbent and fast drying qualities of our previous entry. But it also features a few key differences that might make it the perfect choice for you. First of all, it comes in four sizes: small (16”x32”, two pack), medium (40”x20”, one pack), large (60”x30” and a 16”x16” bonus towel), and extra large (72” x 32” plus a 16”x16” bonus towel). I would recommend purchasing the large. You get a full body towel and a smaller face cloth for the price of one. Both towels come with a snap loop at one corner, making them easy to hang and dry. All size options come with an easy-to-pack mesh carrying case. The mesh bag comes with a carabiner, which makes it easy to clip to the outside of a backpack or cross-body bag. That means that not only do you not have to sacrifice interior packing space, but you can pack a wet towel if you are in a rush without worrying about getting the interior of your baggage wet too. It comes in 6 great colors. If you are looking for something a little less utilitarian, and a little more stylish, this Turkish towel is perfect for you. Turkish towels are super thin and usually come with a striped design. Recently they have been all the rage on pool decks and in spas. 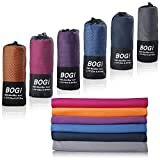 They are usually large like a throw blanket and offer a lot of coverage for a relatively small amount of packing space. It is 100% cotton, which means it won’t dry as fast as the microfiber towels. But if you are taking a luxury trip and have an opportunity to hang things to dry, this towel will look much more luxe than a sporty microfiber towel. This towel comes in an astounding 39 different color options. You will definitely find one to match your personal style. If you are looking to combine the qualities of a microfiber towel with the style of a Turkish towel, then this product from Dock & Bay is perfect for you. 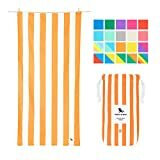 It is made of a microfiber material but comes in a beach-towel size and a classic striped design. Sand doesn’t stick to microfiber. So not only is your towel nice looking, super absorbent, and fast drying, it won’t bring half of the beach home with it! It comes with a conveniently small zippered carry case. This makes it easy to pack and stow. It also comes in square or round options, each one in a variety of colors. Make sure you have this towel with you the next time you take a beach vacation. If you like the idea of washing your face with a clean towel every night, but won’t have access to an easy way to wash a facecloth while on the road, this product is your solution. 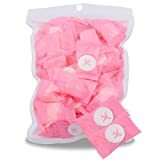 These personal towels come in an amazing, dehydrated and super compact state, individually packaged like after dinner mints. To use it, all you have to do it soak it in water for a few minutes, and it unravels into cotton towelette. It would be super easy to throw a week’s worth of these in your toiletry bag. Hydrate, use them and dispose of them as needed. You can buy them in packs of 50, 100, or 150. Never again will you have to use a questionably clean towel on your face or body. With these, you have a compact, clean wash cloth. So whether you are backpacking, camping, hitting the beach, pool, or spa, there is an option. Figure out which travel qualities are most important for you. Whether you prefer compact packing, absorbency, drying capabilities, or style, make sure it is with you the next time you hit the road.